Jim Hansen’s GISS have just put out an article that contradicts everthing we know about the raw data for global temperatures over the last decade. How does Hansen do it? A large part of the answer is chartmanship — the art of creating almost any impression you want by the way you draw a chart. If the vertical axis on the chart below had been much compressed, for instance, you would see an almost flat line instead of a steeply rising one. But that is only part of the story. There is statistical jiggery-pokery going on too. I reprint the GISS article below — with its accompanying graph — followed by some comments from physicist F. James Cripwell, a former scientist with UK’s Cavendish Laboratory in Cambridge who worked under the leading expert in infra red spectroscopy — Sir Gordon Sutherland – and worked with the Operations Research for the Canadian Defense Research Board. Climatologists at the NASA Goddard Institute for Space Studies (GISS) in New York City have found that 2007 tied with 1998 for Earth’s second warmest year in a century. 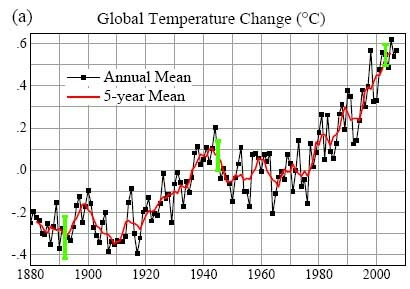 “It is unlikely that 2008 will be a year with truly exceptional global mean temperature,” said Hansen. “Barring a large volcanic eruption, a record global temperature clearly exceeding that of 2005 can be expected within the next few years, at the time of the next El Nino, because of the background warming trend attributable to continuing increases of greenhouse gases.” The eight warmest years in the GISS record have all occurred since 1998, and the 14 warmest years in the record have all occurred since 1990. Goddard Institute researchers used temperature data from weather stations on land, satellite measurements of sea ice temperature since 1982 and data from ships for earlier years. The greatest warming in 2007 occurred in the Arctic, and neighboring high latitude regions. Global warming has a larger affect in polar areas, as the loss of snow and ice leads to more open water, which absorbs more sunlight and warmth. Snow and ice reflect sunlight; when they disappear, so too does their ability to deflect warming rays. The large Arctic warm anomaly of 2007 is consistent with observations of record low geographic extent of Arctic sea ice in September 2007. “As we predicted last year, 2007 was warmer than 2006, continuing the strong warming trend of the past 30 years that has been confidently attributed to the effect of increasing human-made greenhouse gases,” said James Hansen, director of NASA GISS. A minor data processing error found in the GISS temperature analysis in early 2007 does not affect the present analysis. The data processing flaw was failure to apply NOAA adjustments to United States Historical Climatology Network stations in 2000-2006, as the records for those years were taken from a different data base (Global Historical Climatology Network). This flaw affected only 1.6% of the Earth’s surface (contiguous 48 states) [But the US data is also the highest quality data. Much of the data from elsewhere is dubious. To say that the rest of the world is warming is an act of faith] and only the several years in the 21st century. I do not believe the world’s climate is on a warming trend, though I cannot as yet prove this. It is quite true that since somewhere around 1970, the world has warmed up. What is not clear is that, as of now, the world is still warming up. And, of course, “now” is moving. As time goes on, I believe the indications that the world has ceaased warming, and has started to cool, will become more and more obvious. As I have noted before, there are four major agencies which measure average global temperature anomalies, and report them of a monthly basis. These are NASA/GISS, NCDC/NOAA, HAD/CRU and RSS/MSU. The first, NASA/GISS data, shows that at present, average global temperatures are increasing. The other three show the opposite, that they are decreasing. I am suspicious that Jim Hansen and Gavin Schmidt are closely connected with the NASA/GISS data, but they are very competent scientists with impressive credentials. If you ask for a linear least squares regression analysis, you find a linear trend of increasing temperatures. However, if you ask for a non-linear analysis, NASA/GISS shows an increasing trend, but the other three show that temperatures has passed through a maximum, and are now decreasing. What is missing is an independent study to compare and contrast the four ways of measuring world temperature anomalies, coming up with an opinion as to which is “best”, whatever this means. Until we have such a stduy, we are unlikely to make any progress in this area. Or we must wait until the data showing that world temperatures are decreasing becomes too overwhelming to be ignored. No user commented in " CHARTMANSHIP AND MANIPULATED DATA FROM GISS "